You’ve probably seen a number of period British films showcasing mansions with expansive gardens filled with geometrically shaped hedges. 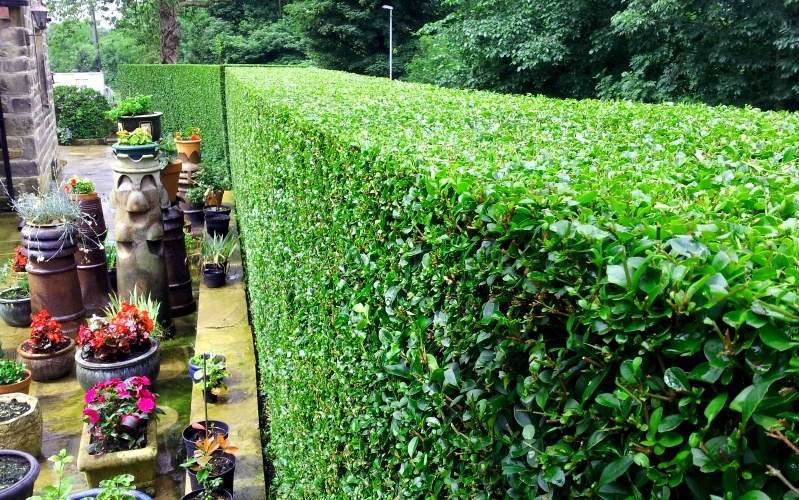 If you want your garden to have elaborately designed hedges, you’ll need a professional to do the job. And this is where we come in. Our Hawaii hedge trimming company can create a beautiful garden on your property. We will consult with you as to the size, height, and shape of the hedges you want so that your garden and your property will look as spectacular as those British mansions. Your garden will be the envy of your neighbors and your guests will be awed every time they visit your home. You need to realize however that a hedge isn’t a piece of inanimate sculpture. It’s not marble or concrete. It grows and grows and will never stop growing! You’ll need our hedge trimming services so that your hedges can maintain their perfect shape and size. Hedges can grow in various directions, and they certainly don’t grow evenly. Without trimming, your impeccably sculptured garden can become a mess in just a short while. Without regular trimming, even simple hedges can look messy and it can make your home appear like an abandoned property. Surely you don’t want your home to be an eyesore right? You might think that you can do the task of trimming your hedges on your own. It’s going to save you a few dollars at least. But why do it yourself when you can hire the experts? In all probability, you don’t have the skills, experience, and tools to do the job as well as we can. In fact, we’re pretty sure that even our competitors in the industry won’t be able to surpass our work. We’re that good. When you choose us, we’ll make sure that everything turns out great in the end. We can trim and shape your hedges according to your requests and specifications. We can do the job very quickly too. And of course, we also take care of the debris, so your garden will be clean, organized and beautiful by the time we’re done. You can just relax and spend time with your family while we do what we do best. It’s a win-win situation, as our rates are eminently affordable. People and companies who sell homes consider our services as a wise investment, as the returns are much greater in value than the rates we charge. If you have hedges in your property, you may call us at (808) 725-3070. We will first check your hedges to see how we can improve their appearance, and we can schedule the trimming job as soon as possible so that your garden will look as beautiful as it once was. With our hedge trimming service, you can transform your yard into a lovely garden and we can even maintain it regularly so you don’t have to.